If you haven't heard of Toronto's Spoke N' Heard collective, there are three things you should know that they stand for: music, art and legacy. That is, naturally then, what was branded across dozens of t-shirts inside Adelaide Hall on last night (May 22), worn by a room filled with artists, social innovators and entrepreneurs. What started as a small seed in the arts and culture community is now a five-year-old staple, thanks to founder Jordon Viera and various supporters over the years. To celebrate their fifth anniversary, Spoken N' Heard laced the anniversary event with jaw-dropping house band the Dirty B-Sides and performances from several artists in the Greater Toronto Area, balancing a mix of both newer names and those with veteran status for the night's festivities. 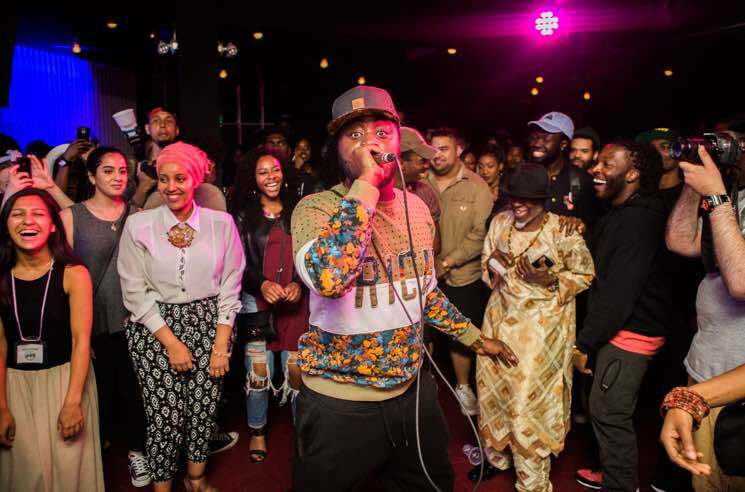 Brampton rapper Derin Falana kicked off the night with high energy, performing singles off his 2015 self-titled EP, and was quickly followed by the sultry and captivating Jayd Ink. In the intimate setting, Jayd Ink captivated the crowd with her newest single "Truth Is," but it was the unreleased "Dark Skin," addressing shadeism in the black community, that left the crowd blissfully silent. What logistically served as an intermission halfway through the night became an open mic stage, backed by the Dirty B-Sides' eclectic versions of songs like Kanye West's "Get Em High," and Musiq Soulchild's "Just Friends." A few incredibly talented singers and rappers lined the stage, trading off mics, and although Jayd Ink and Falana each took to the stage once again, it was a brief surprise appearance from singer Adria Kain that really hyped up the crowd. Raz Fresco then drove the show into even higher gear with music from his Pablo Escobar project, as well as new music like "Flows on Flows" before calling newcomer StoRi to the stage, circling back to what Spoke N' Heard stands for — cultivating safe spaces for artists to work together. Even more importantly, themes of social (in)justice and pride echoed throughout the night, like when Erik Flowchild took the stage rapping, "I know my make, I know my fabric" from "All I Know," and when songbird Shi Wisdom followed by calling on Spekwon to perform his single "Black Body." After that, Mississauga rapper Rich Kidd dedicated a new song to the late Redway and reunited with his Naturally Born Strangers colleagues Tona and Adam Bomb to perform "No One Knows My Struggle." Whether by coincidence or by design, those themes created an atmosphere that was rich in both talent and positive energy. The evening celebrated the last five years, but also pointed to a hopeful future for the Spoke 'N Heard collective and all of the artists who performed at the showcase.